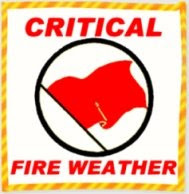 A CRITICAL FIRE WEATHER PERIOD IS EXPECTED IN THE NORTH BAY MOUNTAINS FROM SUNDAY NIGHT THROUGH TUESDAY. STRONG HIGH PRESSURE WILL BUILD OVER THE REGION FROM SUNDAY INTO MONDAY. BY SUNDAY EVENING A LIGHT TO MODERATE NORTH TO NORTHEAST WIND FLOW WILL DEVELOP OVER THE NORTH BAY MOUNTAINS. AT THE SAME TIME LITTLE OR NO RELATIVE HUMIDITY RECOVERY IS FORECAST SUNDAY NIGHT INTO MONDAY MORNING. NORTH TO NORTHEAST WINDS WILL CONTINUE AT LEAST THROUGH TUESDAY... ALONG WITH HOT AFTERNOONS FOLLOWED BY WARM NIGHTS WITH LITTLE OR NO RELATIVE HUMIDITY RECOVERY. I just came across from this site and I read it. It is so nice and I get many thinks about the different flags. So thanks for posting me. I often visit on this site. For the more information visit on www(dot)freedomdisplaycases(dot)com.